Nurses have always been a vocal part of the charge to innovate in healthcare. But is healthcare leadership listening? There may be a new shift coming in the way nurses will want to be more hands-on as leaders. In a recent survey of nurses conducted by AMN Healthcare1, 82% agreed that more nurse leaders were needed. And yet 61% of nurses said they would not consider moving into a leadership position. But before you wonder how leadership can occur in the midst of a nursing shortage and reticence to take the reins, consider that Millennial nurses (19-36) were more likely – 36% more than their older counterparts – to be interested in leading. As they become more seasoned in their careers, they are more likely than nurses in the past to take on leadership roles. Combine the rise in ranks of Millennial nurses with the increasing healthcare commitment to value-based care, and nurses are poised to make huge differences in shaping the care landscape. Nurses are among the most likely candidates to have insight into crucial elements like potential efficiencies, workflow improvements and opportunities to improve patient safety. As for their thoughts on how to make necessary healthcare improvements, nurses are champions of technology: 67% in the AMN Healthcare study said they believed technology to be a top contributor to quality of care. The technology development process needs to be a collaborative partnership among medical technology companies and all clinicians, including doctors and nurses alike. Better connecting team members, from nurses to specialists to surgeons, to deliver value-based care. The MedPresence™ system is a good example of better connectivity through technology, as it provides real-time sharing of HD video and high-resolution procedural imagery, applications, and in-room frame of reference to create a context-rich, immersive virtual experience. The system, which was developed with deep input from the field including OR nursing teams, is intended to empower surgical and care teams to quickly and securely connect to clinical specialists, technicians, trainers, or manufacturer’s representatives from across the organization or around the world, and at any time – virtually. Also influenced by nursing is the development of a truly integrated OR, EasySuite 4K, which enables surgical and interventional clinicians to connect with the native and uncompressed visual insights derived from legacy, HD and ultra-high definition (UHD) medical sources to streamline pre-, intra-, and post-operative clinician workflows. Its simplified access to visual insights enables more effective and efficient decision making throughout the continuum of care. 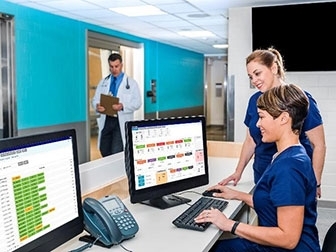 Better connecting systems for more streamlined availability of pertinent and often data-intensive clinical information throughout the facility. In the GI suite, for example, nurses are often at the forefront of infection control. They are often tapped to identify workflow improvements, and in the case of GI equipment, to improve turnover without risking missed reprocessing steps. For example, scopes that hang too long in the cabinet or that are jostled in transport can pose risks. Facilities are looking for ways to replace time-consuming steps and improve asset allocation while adhering to proper reprocessing protocols. They have shared their challenges with Olympus and been instrumental in our development of UNIFIA, an automated endoscope tracking and management software that allows healthcare professionals to have greater visibility and operational awareness of their departments. Better protecting employees in the OR by taking the heavy lifting off of nurses. It has become common knowledge that moving and lifting patients is the leading reason that nurses are injured. According to surveys by the Department of Labor's Bureau of Labor Statistics (BLS), there are more than 35,000 back and other injuries among nursing employees every year, severe enough that they have had to miss work2. In the OR, where every minute counts, situating not just the patient, but the equipment, is often the job of the nursing team. Olympus recently partnered with AMICO to address these issues, with an integrated hardware solution of booms and lifts that allows for easy set-up of OR lighting, big screen positioning for the surgical team, and patient lift technology. The Patient Lift Pendant brings to the OR an ergonomic method of transferring patients into the surgical field directly from a ceiling mounted boom. Other applications for the PLP include elevating and holding appendages during long surgical cases. Listening to nurses, and backing up that listening with support for nurses’ recommended solutions, will be key to driving healthcare improvements. And with a rise in more willingness among nurses to lead, this couldn’t be a more exciting time for medical device companies to work with nurses in making innovations. For half its 100-year history, Olympus has worked with health care professionals to combine our innovative capabilities in medical technology, therapeutic intervention, and precision manufacturing with their skills to deliver diagnostic, therapeutic and minimally invasive procedures. For more information, visit medical.olympusamerica.com and truetolife.com. I might not be the best person to comment because I am retired. And jaded. This looks like advertising trying to pass as an article. "Healthcare leadership" typically does not listen to nurses, but if you have something shiny to sell them, they're probably willing to cut a position or six to buy it. I don't know any nurses who say more "nursing leadership" is needed, unless what you mean is for nurses to have more say in the running of things. What nurses want is some breathing room in their work day. A chance to take breaks, with their patients being properly cared for in their absence. A few minutes to rehydrate and reoxygenate themselves. Your corporate buzz-speak doesn't reassure me that this will be the case. Amen I am active in the field and can tell you until we have a decent EMR, time to go pee, not have to handle bariatric 350# patients alone, try to get helpless patients up in a lift to weigh, have more than 30 minutes to walk to lunch, eat and report back, stop having to deal with Rx orders not being filled, be able to actually leave on time... all the “tech” BS won’t mean a thing!! Also how many times have we been told to Not depend on tech and handle it with real observation. Yes. I agree! This is advertising!!! This board is supposed to have more integrity than that!!! Where are the monitors ??? tYes. I agree! This is advertising!!! This board is supposed to have more integrity than that!!! Where are the monitors ??? It’s “sponsored content.” They green-lit it.